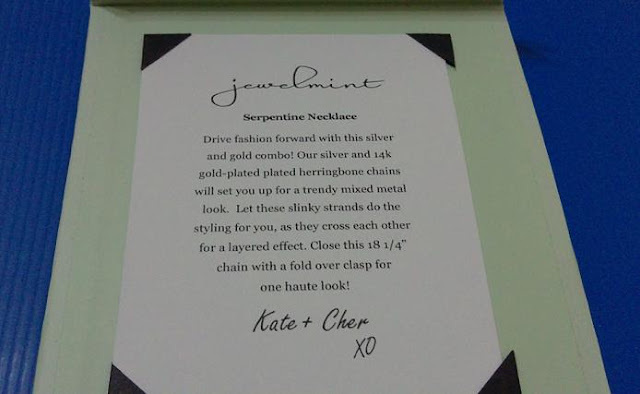 Got the Serpentine Necklace from Jewelmint. If you watch Youtube, you would probably know what Jewelmint is. It's basically an online store selling jewellery pieces designed by Kate Bosworth and Cher Coulter. 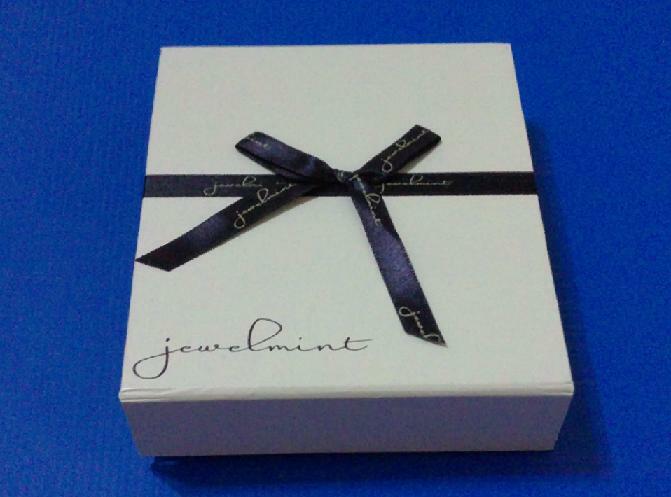 It comes in a neat mint green box with a black ribbon. You do not have to untie the bow. It's just a separate piece of ribbon in a bow shape stuck on another piece of ribbon . I feel kind of foolish untying it. -.- You just have to slip the whole thing off the box. Inside the box, it comes with detailed information on the piece. The mint green box is more true to colour in the second photo. The box is also well packed with black cushion. So after removing the top layer of cushion, tada, here comes the necklace. The Serpentine necklace is made with gold and silver herringbone chains that crossed each other in the front, giving a layered effect. 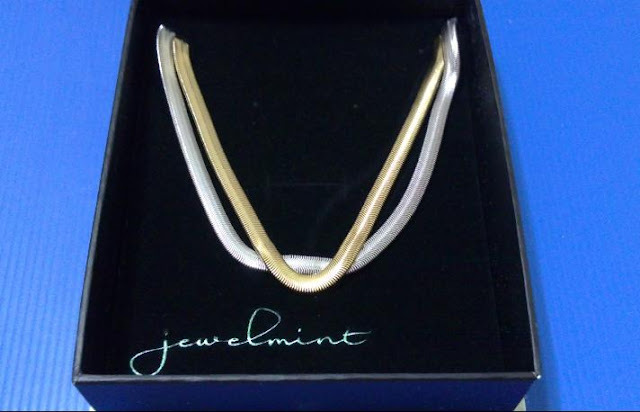 I was impressed that it appears true to the photo provided on the Jewelmint website. The necklace is really pretty. It appears to be really simple but when you touch it, you can feel that it's quite substantial. The piece is also quite shiny in real life. 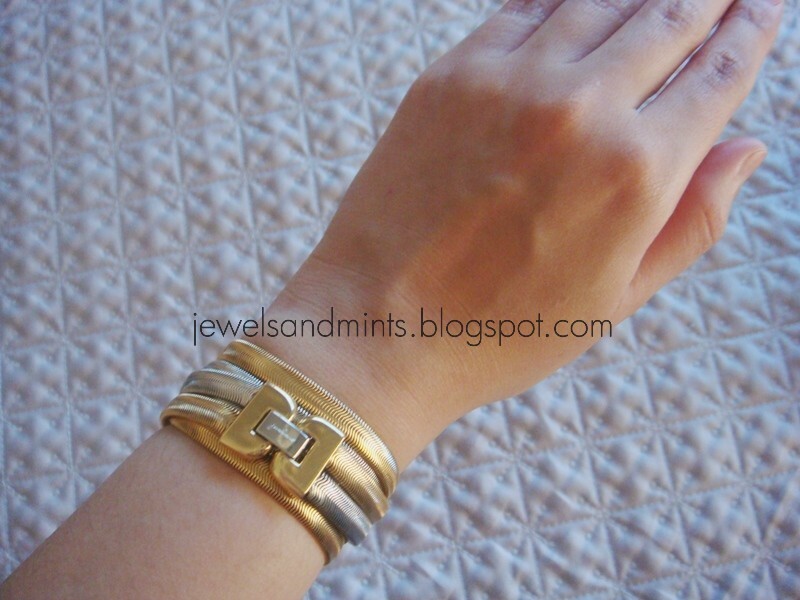 At the back, you get a clasp that's like those you find on watches. Generally, I find it a pain to open. I laid it flat in the photo above so you can see the gold and silver slinky chains crisscrossing each other at the front. 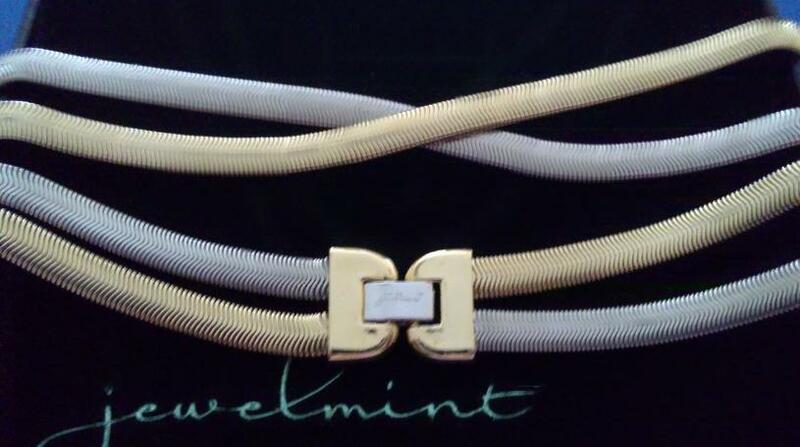 Here's a closeup of the Serpentine necklace. I had a hard time capturing the real colour of it as it just appears super shiny on the camera. But the colour's pretty close to the closeup shot. Look at how the two chains intertwine with each other. 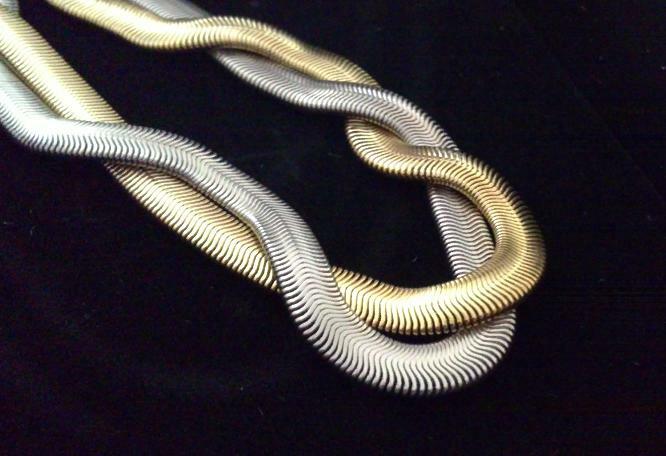 Now you know why it's called the Serpentine necklace. 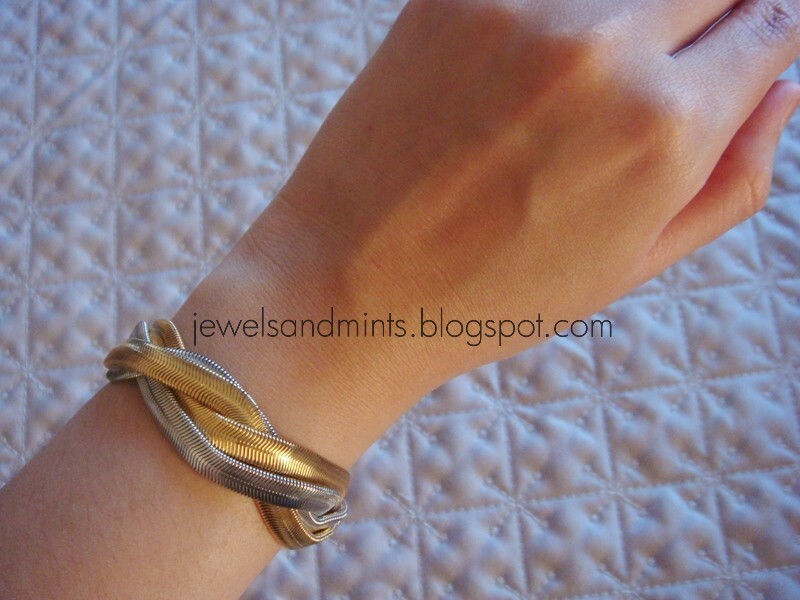 Jewelmint also suggested that it could be worn as a bracelet. Overall, I love it. I picked this up because I find it to be a versatile piece for wearing with collared tops, dresses, dressing up simple tops or layering with longer necklaces. Generally I am not a fan of slinky chains like these but I think it goes perfectly with this design. I love that this design is very simple, yet sleek and also the two-tone concept. Like I said earlier, the necklace is also very substantial and definitely doesn't look or feel cheap. One thing that I probably would rethink about is the price. Each Jewelmint piece is priced at US$29.99. In all honesty, I wouldn't pay full price for it. But I've seen discount codes floating around and "Buy one get one" sales, so that would be a great time to buy instead. Currently, Jewelmint only ships within the US. They do not take international orders at the moment.